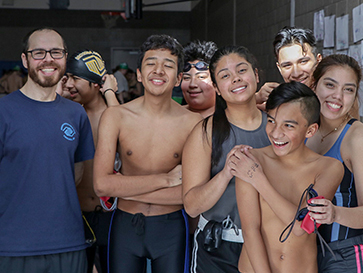 Traverse Robinette is the Aquatics Director at BGCB’s Gerald and Darlene Jordan Boys & Girls Club in Chelsea. Tell us a little about your background and what brought you to BGCB. I’ve been teaching swim lessons and lifeguarding since 2005. When I was in college at Massachusetts College of Art for Photography, I worked as a swim instructor and lifeguard. After I graduated, I was lucky enough to land the aquatics director role at the Gerald and Darlene Jordan Club in Chelsea. I have really enjoyed the fast pace and unique environment of the Club over the past eight years. What is your favorite part of your job? My favorite part of the job is seeing our members learn how to swim and be safe around water. The smiles on their faces when they advance to the next swim level are the most rewarding part of my job. What do you like about being employed by BGCB? I have a background in art, and at BGCB I can use my creativity to offer unique programs to our members such as surfing, snorkeling, scuba diving, rock climbing, and art club. The other amazing thing about the Club is we have all four seasons: fall, winter, spring, and summer. Each season I get to do something different. Fall and winter is swim team. Spring is art club and rock climbing. Summer is surfing, snorkeling, and scuba diving. Swim lessons and lifeguarding are year-round. How do you describe your job to friends and family? It’s easiest to explain to friends and family that I’m a swim teacher. If they ask for further explanation, I go into greater detail about the programs that I teach. At the Club, I’m a teacher of swimming, lifeguarding, snorkeling, surfing, scuba diving, rock climbing, and art. Find your next career with Boys & Girls Clubs of Boston.